Support a single coaxial, fiber optic or copper cable or aerial innerduct up to 2.75" (70 mm) outside diameter with Condux Single Roller Cable Blocks. A built-in strand lock fits up to 3⁄8" (10 mm) strand to prevent creeping. 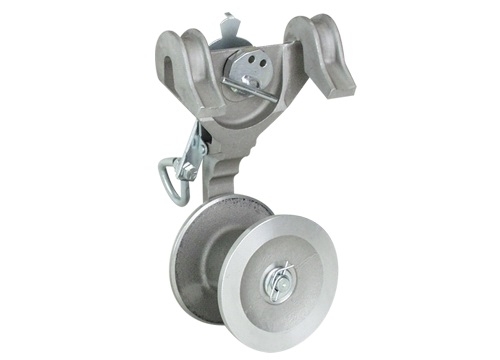 The lock will be released when struck by a Cable Block Pusher ahead of a Cable Lasher. Frames are durable cast aluminum or molded plastic with steel inserts on strand contact surfaces. Rollers are plastic or aluminum. 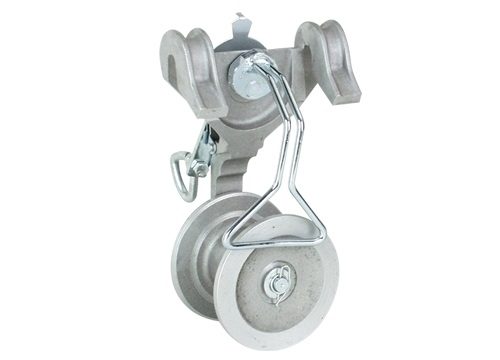 Single Roller Cable Blocks may be equipped with a steel cable retainer to keep the cable or innerduct on the roller, even in low-tension situations.